Zombies have infested some of the most populous cities around the world. Your mission is to neutralize them. You have limited sorties and bombs. This iPad app takes advantage of the portable large screen. The control comes in a pair, on left and right, so you can play naturally no matter left or right handed. The control pads can slide up and down the sides so as to adjust to your way of holding the iPad. And you can play it in landscape as well as portrait mode, you can even rotate while in play. 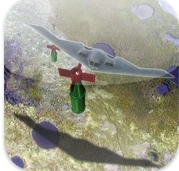 If you just like to go around bombing places, the app has a free bombing mode whereby you choose any place you want on the globe and start dropping bombs on it. With iPad’s large and clear screen, you can make beautiful art on Mother Earth with your bombs. This is a great way to learn some Geography concepts too. Next Post Err…What is DSA-Secondary?